The Kuiper Belt is a donut-shaped region of icy bodies beyond the orbit of Neptune. Because small Kuiper Belt objects were some of the “feedstock” from which planets formed, this research provides new insights into how the solar system originated. This research was published in the March 1 issue of the prestigious journal Science. 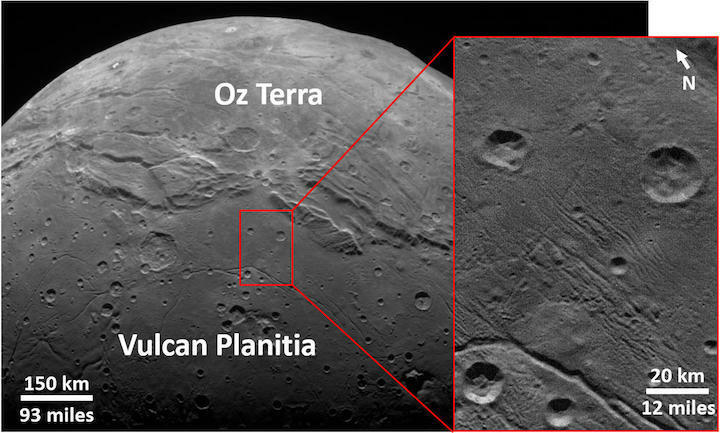 The paper published in Science is titled “Impact craters on Pluto and Charon indicate a deficit of small Kuiper Belt objects.” The Johns Hopkins University Applied Physics Laboratory in Laurel, Maryland, designed, built and operates the New Horizons spacecraft, and manages the mission for NASA’s Science Mission Directorate. The MSFC Planetary Management Office provides the NASA oversight for the New Horizons mission. Southwest Research Institute, based in San Antonio, directs the mission via Principal Investigator Stern, and leads the science team, payload operations and encounter science planning. New Horizons is part of the New Frontiers Program managed by NASA’s Marshall Space Flight Center in Huntsville, Alabama.